Wabash men have arrived at destinations across the country and around the world for a spring break of immersion learning, service, performance, and sports. Wabash’s immersion learning is unique in that it is part of the students’ tuition. They provide their own spending money and cover some meals. Students on nearly every trip will be writing daily about their experiences. Read about the life-changing experiences Wabash students have on these trips by clicking on any link below. Modern Languages Professor Greg Redding is traveling with 13 students based in Cologne, Germany, for a 200-level class in German Language & Culture. English Professor Warren Rosenberg is repeating his popular trip to New York with his Studies in Media class that has 15 students enrolled. Professor Crystal Benedicks is traveling with the group. The jungle-like conditions of the Everglades isn’t the glamour of New York, but eight Advanced Ecology students are with Professor David Krohne in Florida for a fascinating week in one of the best biology labs in the nation. This is a frequent trip to the Everglades for Krohne and his Biology students. Political Science Professor David Hadley has 13 students in Washington D.C. for his Congress & the Executive Branch class. They will meet with key decision makers and people who shape national policy. Music Professors Vanessa Rogers and Larry Bennett are visiting London and Paris as part of their Renaissance & Baroque Era class experience. That group can be seen in picture at above right in front of the gate of Buckingham Palace. The Glee Club is on the road to Chicago and Cincinnati. The Spring Break tour is an annual event for the Wabash College ambassadors. Click here for a schedule of their performances in Danville and St. Charles, Ill., as well as two performances in Cincinnati. . There are two repeat and one new service trips this spring. Football players made their first trip to Botswana, Africa, two years ago and will return for the third time this year. The group has expanded to 23 athletes and students across campus. The Christian ministry trip includes youth sports camps and prison outreach. Professor of Religion Jon Baer is with 11 students in New Orleans for the third year. The young men helped with Hurricane Katrina cleanup the past two years. Baer said the students may actually be building new homes on this year’s trip. Junior Jake Ezell has put together a new Wabash club aimed at drawing pre-med students into the field of international assistance for children. “Our trip to El Salvador is through the Wabash College Chapter of the Foundation for the International Medical Relief of Children (FIMRC),” Ezell said. New Alex Moseman photos posted in Wednesday's blog update! The Schroeder Career Center is again sponsoring its popular ‘Jim Graham Externship’ program in Washington D.C. Six students are housed with Wabash alums in the nation’s capital. Little Giant athletes have a full week of travel and competition. Cory Stevens' 2010 baseball team is traveling south to Alabama, Texas, and Oklahoma for a 12-game series. Sports information director Brent Harris will be traveling with the baseball team and not only post the usual results but will coordinate blogging from team members. The Wabash tennis team is in Orlando, Florida this year to compete during Spring Break. The tennis team took a break Thursday night to take in the NBA's Orlando Magic. (photo at left). Wabash golfers are in Arizona to play some of the top courses in the Phoenix area during their eight-day trip. The Little Giants will play in a tournament Thursday, but will also practice at Ocotillo, Pointe Hilton, Wigwan, Desert Forest, and Augusta Ranch. Wabash alumni from around the Phoenix area will join the team during their trip, as well. 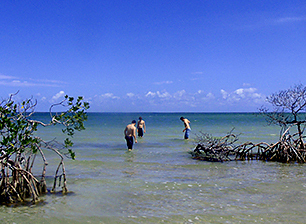 In photos, top to bottom: Students in Professor David Krohne's Advanced Ecology class explore the New Mangrove Islands, Florida Bay. 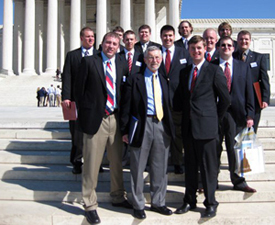 Professor David Hadley and his class at the U.S. Supreme Court. 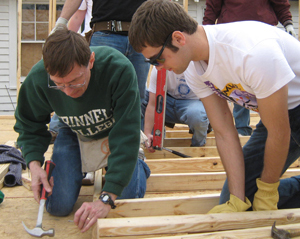 Professor David Maharry joined Professor Jon Baer and worked side-by-side with students building homes in New Orleans. 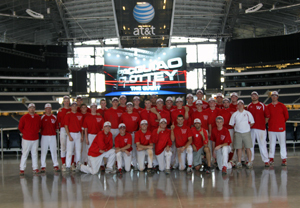 The Little Giant baseball team got a tour of the new NFL Cowboy's stadium in Dallas during their southern state swin.